Reynolds holds the second, third, and fourth most popular brands in the U.S. Is that enough to beat Philip Morris? If you're new to investing, this may surprise you. 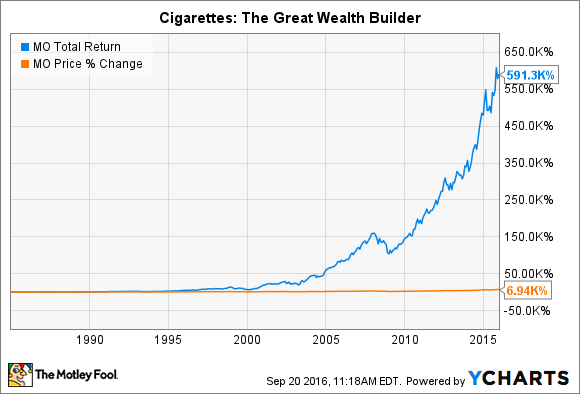 Over the past three decades, there have been few investments that have performed as well as cigarette stocks. While the world was focused on legal settlements for the cancer-causing products, investors benefited from high yields and the ability to use automatic dividend-reinvestments at depressed prices. To give you an idea, check out the graph below on Altria. The orange line represents growth of the stock's price, and the blue line represents the growth investors experienced when dividends and their reinvestment are included. Today, we'll be looking at two of the biggest cigarette companies out there: Philip Morris (NYSE:PM) and Reynolds American (NYSE:RAI). Although there's no definitive way to declare which is a better investment, there are a number of different lenses through which to investigate the question. Below are explanations of the only two that really matter. When it comes to any investment, the sustainable competitive advantages you have -- sometimes called a "moat" -- are the only things that separate you from the competition. Cigarettes themselves are pretty easy to make, so the barriers to entry in the industry are relatively low. However, brand power for these addictive products reigns supreme. Philip Morris owns some of the biggest international names. Chief among them is Marlboro (Altria owns the brand in the United States). According to Forbes, Marlboro is the 26th most valuable brand in the world, valued at $21.9 billion. The company itself claims that, "In 2013, Marlboro's volume outside the United States was 291.1 billion cigarettes, which makes it bigger than the next two largest brands combined." As far as brands and moats go in the cigarette business, it doesn't get much better than that. Reynolds American, on the other hand, is the owner of Newport, Camel, and Pall Mall branded cigarettes. According to the company, these are the Nos. 2, 3, and 4 brands in the nation, respectively -- with a combined 30% market share. That is overshadowed, however, by Altria's Marlboro, which owns a whopping 44% market share. While Reynolds is certainly no slouch, the presence of Marlboro in the United States -- even though Philip Morris doesn't own it -- remains a huge threat. As you probably could have guessed, the main reason investors put their money behind these companies is the dividend. The best way to evaluate the health of these dividends is by looking at free cash flow (FCF). This represents the amount of money a company makes from operations during a year, minus any capital expenditures. At the end of the day, it is from FCF that dividends are paid. Over the past three-plus years, here's the percentage of FCF that was used to pay the dividend. None of these figures are particularly impressive. Philip Morris is using just about all of its FCF to pay its dividend. With volumes shrinking worldwide, management will need to focus on ways to squeeze out more profitability if the dividend is to be maintained, or have any hope of growth in the future. However, Reynolds finds itself in even more dire circumstances. Even before the past two years, the company had trouble producing enough FCF to cover its dividend. Over the past two years, the numbers represent an anomaly because Reynolds acquired Lorillard. With that being the case, the best we can do is rely on historical trends that show the company using just about all of the FCF it takes in to pay the dividend. This is essentially the same as Philip Morris. There might be a slight edge for Philip Morris, here, as its 4.2% yield is higher than Reynolds' 3.9%, but I think this is essentially a tie. While the vote was close, I think Philip Morris is the winner, here. With an international focus, the potential for sustained growth in developing economies, and by far the most popular brand in the world, the company will be able to survive the longest of any of the cigarette companies.